January 21, 2016 – DKI, North America’s largest disaster restoration contracting organization, announced they gave back to the American Red Cross, through the local Potbelly Sandwich Shop’s fundraiser on 2830 S. Highland Ave. in Lombard, IL. Yesterday, the sandwich shop ran a “Half-y Hour” fundraiser from 11:00 AM until 9:00 PM. For any orders placed during this time, the shop gave back 50 percent of their earnings to the Red Cross. 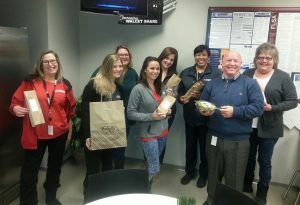 The DKI Corporate Team in Elk Grove Village decided to forgo packing their lunches for work yesterday and, instead, order from Potbelly. “It was a small way DKI could give back, and get a full belly at the same time,” said VP of Operations Bill Robinson. To learn more about the Red Cross and its initiatives, visit www.redcross.org. « Are you using social media to improve your customer service?